I think when we talk about using music or art or theater in the Core classes, there is still this persistent suspicion that a teacher who plays music in the classroom must be too "soft" or "granola-y." Don't get angry; I'm just stating an observation of perception, not a fact of truth. I would push back, however, that using the arts in the core subject-area classes is far from fluffy. What I do understand, however, is that not everyone is a musicologist. Not everyone has in depth knowledge of this composer or that artist, and that can serve as a gatekeeper to incorporating the arts. However, I believe, a more casual everyday use of music can have as much power as explicitly teaching music as it relates to one's subject matter. One doesn't need Bach in the background to qualify as having used music. There are many ways to trigger the benefits of music in, say, a Language Arts class, that doesn't require too much knowledge of music in general. Music can be used to help control a classroom environment or to support the content within that class. It can be used to signal different transitions within the class as well as to serve as a writing prompt itself. Music is also a way to build community and to share yourself as a teacher. After all, if the students don't have a sense of who you are as a human, they will inevitably lose respect for you as a teacher. Music is a way in with students, a way for them to learn about you and for you to learn about them. And we know that reciprocal learning in a classroom, whether to build subject matter competency or community, is key in pulling out the best academic results from those students. The week after I saw The Lego Movie, every period that walked into my middle school classroom was greeted with "Everything is AWESOME!" Haven't heard it? I dare you to be asleep or disinterested in anything for at least a full hour after hearing that 2:43 song. As an a cappella geek, I have been known to play a song from the a cappella group, Pentatonix, every now and then as well. The beat boxing in some of their YouTube videos is slamming every which way you look, and they take on multiple genres with their beautifully blended voices. Reciprocally, I never thought I'd actually appreciate K-pop until my students shared it (sort of in thanks for me turning them onto some Danny Elfman scores). Music helps create a classroom environment of creativity, but I would also add that it helps make the brain more receptive to deeper critical thinking. Music opens up neurons, opens doors in your brain that create a kind of loft space receptive to learning. 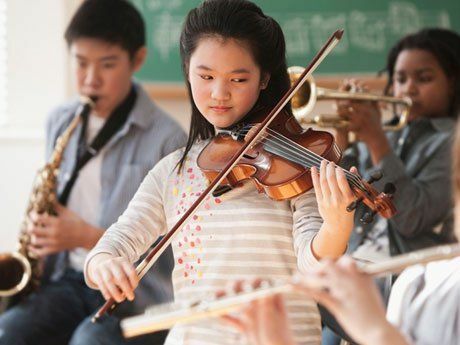 Using music as an aid in memorization is just plain smart. Add in songs that are focused in your content area, and they're gold. That's why history teachers still use "Elbow Room" from Schoolhouse Rock fame to introduce the concept of exploration. As a Language Arts middle school teacher, I love the Princeton Review Vocab Minute podcast. You can look through the list of short minute-long songs that teach concepts from word origins to synonyms. I love looking at lyrics through a poetic lens. Clearly I'm not alone because my own second-grader's teacher sent him home with the printed out lyrics to Imagine Dragons' "Radioactive." My son had circled the nouns and underlined action verbs. In my own classroom, I have even had students create a web trying to trace the logic from Willie Nelson's version of "I Am My Own Grandpa." Picture this. The students enter the classroom. John Williams is playing on the speakers. Maybe it's the ominous opening from the film Jaws or the flying sequence from Hook. Now write. Earlier this year, my students embarked on a project-based learning unit that I developed based on the United Nations. On each day, we had music from the different nations playing, national anthems, processional marches, etc...as we role-played as ambassadors to the U.N. I once did a great project when I was in eighth grade in Ms. Sauve's class that's always stuck with me. We had to develop an album cover, complete with visuals on the front and a song list on the back. We then had to include a dust jacket that had lyrics to each of the songs. As I think about it, there would be something interesting to have the students develop a mythical playlist, a mix-tape of sorts, that tells a story through its song titles. Commercials jingles are a great way to show that people are writing persuasively in many genres and in many modalities. Have students analyze a jingle as you might analyze an article or review. Better yet, have them write one. Music reviews are persuasive, sure, but they are also a form of literary analysis. Look at Amazon reviews or Rolling Stone reviews for elements of analysis. Have students listen to the music they are referring to. Did the reviewer miss the boat? Do they agree with the review and what evidence can they bring to the table to prove their analyses? #8 Music to take "Syn-naps"
Last, but not least: simply turn on a good tune every now and then. I talk a lot about Judy Willis' concept of "syn-naps." This is when you wake up the brain by jolting it a bit. Sometimes you can use an image stuck in the middle of a Powerpoint slide, but music works beautifully as well, flicking the groggy brain into wakefulness. It doesn't have the last long, merely a stanza or two, but enough to get the oxygen back to their noggin' and the alertness back in their eyes. I could pretend that I use music in my Language Arts classroom because of all the brain-based research that surrounds its use as a learning enhancer. But the fact is, that I use it to set a tone in my classroom -- a tone that acknowledges that music is in our species' blood, that it makes us smile and cry and laugh and a have a common experience in our hearts. Creating a common experience with your students is what one's classroom should be all about. Is it place students want to go? Is it a place that isn't a waste of their time? Is it a place that cares about their interests and challenges them to appreciate others' interests? Music helps towards all of those goals. How do you use music in your classroom? Please share in the comments section below.